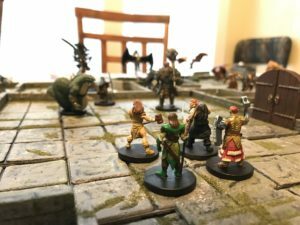 Recently, a friend’s kids expressed interest in learning how to play Dungeons & Dragons, so this friend reached out to me to ask how they might learn how to play. I suggested that they come over for an afternoon and Sarah and I would teach them how to play as best we could after checking around and not finding an active Adventurer’s League in the area. We invited along our 12 year old nephew who lives near by, and Sarah rolled up a character to round out the party, which she shared some with Little Dude Tolbert, who yes, is on the young side to play a game like this, but you try stopping him. He knows entirely too much because my office is usually full of D&D stuff. Mostly, he sat on Sarah’s lap and goofed around, didn’t pay super close attention. He had fun rolling the dice and moving the miniatures, and he loved listening to the bigger kids have fun. We ran the session today and it served a reminder to me to how fun Dungeons and Dragons can be the first time. Kids who have never played before have only the vaguest preconceived notions of what D&D is and how it should be played, which meant that they had some great and inspiring moments. Here are some anecdotes and loosely organized thoughts about the game. This was a simple “meet in a tavern and get hired for a job” gig. They were hired by a merchant to recover some stolen property. Right away, they pressed the merchant to know exactly what was stolen. After some successful persuade checks, they learned that the property was “livestock.” Later, they learned that it wasn’t exactly legal. I was hoping for some misdirection here, but pretty much not thirty minutes in, they guessed that the “livestock” were people, which they were immediately down to put a stop to all of it. It went from a “find and retrieve job” to a rescue mission, and right away they planned to pay a visit to their employer afterward, which they did with fiery anger. I worried a bit that “slavery” might be too heavy a topic for kids, but it brought up conversations about Abraham Lincoln and there was no discussion over whether or not they would end it immediately. All of them had already learned about our country’s history of slavery and they were not okay with it. The kids are alright. If you want to have a lot of fun with a character with low intelligence, have a three and a half year old role play it’s dialogue. At once point, after they rescued the stolen children from evil cultists, the fighter was put in charge of baby-sitting them while the rest of the party went off to deal with their “boss.” Little Dude Tolbert’s first words to the kids, said in an adorable, gruff voice: “Hey, you kids! Don’t do anything with my legs. And just stay in this room.” There were several other great lines. The nephew rolled up a bard with the ridiculous name of Jerry Jeff Parkanson, or “JJP” to his fans. The other players rapidly became his fan club, and any time it was JJP’s turn to act, they chanted “JJP! JJP!” Yes, even Little Dude Tolbert got in on the action. This made the nephew feel like a star, and helped bring him right into the game. Everywhere they go in the future, the legends of JJP will travel with them. The younger brother of the teen created a delightful halfling rogue with a big mouth who got them into trouble more than once. He also helped the bard come up with some spectacularly hilarious insults to use for his main attack spell which involves insulting the bad guys to death. Nearly every encounter began with an attempt by them to either use diplomacy or bluff their way out of. They tried intimidating wolves, talking their way out of fights with kobolds, and they even managed briefly to disguise themselves as evil cultists to try and stop a very bad ritual meant to serve the stolen children up for dinner to evil monsters. Again: the kids are alright. They fought only when the bad guys gave them no choice. Which, this being D&D, was more often than not. Kids’ emotions are double that of adults. A bad die roll, and they’re kinda devastated and you have to boost their spirits a bit. A natural twenty, and they’re doing a little victory dance around the table and cheering as they finish off a bad guy in one blow. Their highs and lows are wild to witness, and it made the game even more fun for me than usual. All of this made me even more certain that one of the main directions for Level Up Guild needs to be our “DM in a Box” service, and we need to market to parents of teens and pre-teens. I won’t even care that much that I’m making a lot less doing this than I do building websites. I kinda want doing this to be my job in the future. I should probably work to develop more kid-friendly plot lines and bad guys. I’m not sure I have *any* idea what’s properly age appropriate because I was playing D&D at 6 and there weren’t really “age appropriate” things when I was growing up. I probably helped kill half the princes of Hell in D&D by the time I was 10. Skeletons and zombies are an easy thing to have them fight, though, so we did a lot of that. They’re basically the D&D equivalent of robots. I never had to explain some basic mechanics, like what “hit points” are or “armor” or the types of weapons, the different fantasy races, etc. Some of the stuff we didn’t know about when we were kids playing for the first time, these kids have absorbed through video games and other media. D&D is by nature kind of violent when played the usual way, and parents need to be cool with that. Little Dude Tolbert and his mom and I had a long talk about makebelieve and pretend and how everything is just a game. He rolled with it really well, and had a good time rolling dice and doing math. I would say that D&D is no more violent than modern video games (probably much less vividly so), but my combat descriptions could probably stand to be toned down as well, at least when playing with younger folks. We can fade the violence into the background of hit points and maybe I don’t need to be visceral at all in my descriptions with them. I’ve actually been struggling alot with the themes of violence and adolescence as I work on the Dungeonspace stories. I also want to try my hand at writing more adventures that have less combat, and have bad guys run away or surrender more often. In general, I learned an enormous amount from running this game, and I am looking forward to playing with these kids again. They were excitedly talking about what they would get at future levels and how they would deal with the three children they rescued, so I feel obligated to play with them again some time soon. I am really looking forward to learning yet more lessons of how best to DM for a group of mixed age kids.